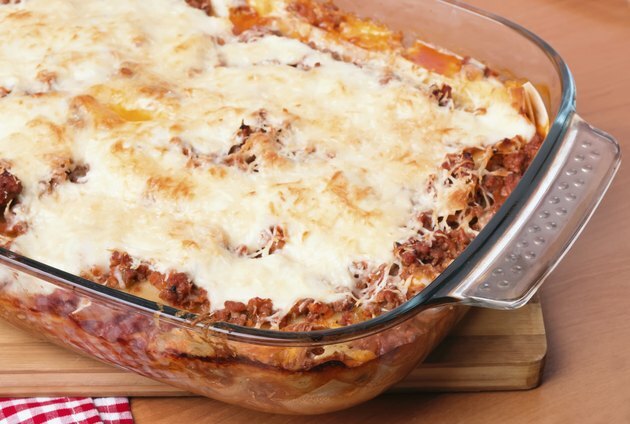 Lasagna is a substantial make-ahead meal that you can pull out of your freezer on a busy night. This classic comfort food freezes wonderfully, is super-filling and is always a crowd pleaser. You can reheat frozen lasagna in the oven or microwave to have a delicious meal on your table with little effort. Reheating lasagna from frozen takes some time, so be sure to plan ahead. Preheat your oven to 400 degrees Fahrenheit. Cover the lasagna in aluminum foil and place it in the oven on a middle shelf. Heat the lasagna in the oven until the fillings begin to sizzle. Take the internal temperature of the lasagna; it should register at 165 F using a kitchen thermometer when it is fully heated. This may take upwards of 1 hour to complete, depending on the number of layers included and how large a lasagna you are reheating. Take the foil cover off of the lasagna and continue cooking it for about 10 more minutes, until the top is well browned. Remove the lasagna from the oven and allow it to rest for 5 to 10 minutes before serving. Place the lasagna on a microwave-safe plate or tray. Cover with wax paper or microwave-safe plastic wrap to prevent splattering. Use the defrost setting on your microwave to thaw the cooked lasagna. Depending on the size, this will take anywhere from a couple minutes for a personal portion of frozen lasagna to upwards of 10 minutes for a tray of lasagna. Set your microwave to heat the lasagna at full power once it is thawed; use 2 or 3 minutes on high for a single portion of lasagna and 5 to 10 minutes for larger portions. Use a kitchen thermometer to ensure that the internal temperature reaches 165 F.
For the best results and quickest reheating, thaw the frozen lasagna in the refrigerator overnight. For quicker reheating from frozen, thaw lasagna in the microwave first and then finish it in the oven. Take caution when removing a hot tray of lasagna from the oven and when taking off its cover, as the steam coming from it can be dangerously hot.